I know you might be feeling tired, frustrated or disappointed when it comes to your love life. I wanted to share this inspiring true story that’s sure to shed some light on your experience – chances are you’re much closer than you think to hitting your LOVE jackpot. I also have a special announcement I want to share aboutmy upcoming LIVE 5-Week Soulmate Secret Telecourse that starts Wednesday, June 8th. During the California Gold Rush in the 1800s there was a prospector named Mr. Darby who spent weeks with a pick and a shovel digging for gold ore. He found a fair amount in a short time. He then went backin search of the mother-lode. He dug and dug but couldn’t find any more gold. He decided to give up and sold his equipment to a junkman and went home. The junkman decided to call in an expert, a mining engineer, for help. The engineer checked the mine and calculated that there wasa vein of gold just three feet from where Mr. Darby had stopped digging. Just three feet! The junkman went on to make millions! I share this story with you because you could be just three feet away from your Soulmate and you don’t even know it. Maybe it’s time for you to have your own “expert” help you discover the Soulmate who may be closer than you think! Thomas Edison was fond of saying that inspiration was only one-percent of success and the other ninety-nine percent was hard work. So many people give up on their dreams and desires when they are literally within reach of the finish line. What if you are just three feet from your Soulmate gold? What if all that’s been missing is the guidance, support and step-by-step system you need to access the power to manifest the love of your life this summer? I’m excited to announce, in response to the overwhelming number of requests I’ve received to teach my Soulmate Secret process in a virtual format, I’m going to be teaching a LIVE virtual 5-WeekTelecourse starting next Wednesday, June 8th. I will personally guide you and hold your hand through the process of manifesting true and lasting love. I have designed the course to be a step-by-step process to fully support you to get clear, release what’s been holding you back, and master the process of manifestation so that you can raise your love vibration to attract your soulmate. 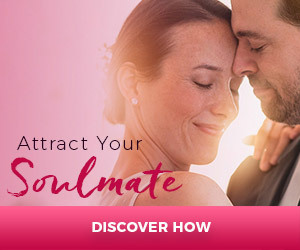 In this course, you’ll join me and my exclusive, online Soulmate Secret learning community each week to learn and apply the simple, secret techniques to manifest your soulmate. You’ll not only receive my live instruction on manifesting your Soulmate, you’ll do so in an environment that’s supportive, encouraging and fun with other committed Soulmate manifestation partners who will support you every step of the way. You’ll also learn powerful ways to unhook the past by cutting the love-blocking energetic cords that bind you to go-nowhere relationships. I’ll show you how to prepare your heart and home so that you can magnetize the right person to you and be ready when the much-awaited day comes when you finally meet your Soulmate. These are the very same processes I used to manifest my husband Brian, and that thousands of singles have used to manifest their beloved. You’ll also get the inside tips, the secret sauce, and my bestt echniques that I know WORK, some of which I’ve never shared before. Now, I know you’re wondering how this can work – indeed, if this will work. Like many people, you may have (almost) given up on finding true love. Maybe you’ve tried the dating scene…and hated it. Or maybe you’ve had some relationships that were the wrong person, the wrong timing, or just didn’t feel quite right. I can understand why you’re so frustrated that almost every other aspect of your life seems to be working…except this. And if you’re like a lot of the men and women I’ve spoken with over the years, you’re no longer sure your Soulmate is even out there. I can assure you, your soulmate is not only out there, they are wondering, right now, when and where they’ll finally meet you! I’m not sure if or when I’ll ever teach this course again live – that’s why I encourage you to register for my course and make this YOUR summer of finally meeting your true love. Find out all the details on our course information page here. P.S. – To support you even further, I’ve brought together some of the world’s leading transformation and dating experts to provide exclusive bonus workshops for course participants to ensure yo have the tools, training and support you need to make 2011 your year for love. Get all the details here.